Buy Infotrip (1st ed) in support of AMD! I’m donating most of the remaining copies of Piracy is Liberation: Infotrip (1st ed) to Aktion Mot Deportation. This is the second book in the Piracy is Liberation series, but it is also my debut graphic novel. The first edition is a bigger size than the usual version and it contains the Desert Anarchist Manifesto which was cut out from the second edition. I think there’s also a typo in there somewhere. Otherwise there’s no real difference apart from the size and cover. It’s yours for 50 SEK and all the money goes to the struggle against the current deportation politics of Sweden and Europe. Yesterday, the Tribunal 12 presented a comprehensive accusation against Europe. Hopefully, the recordings will be available somewhere for everyone who missed it. Send an email to me or antidep@gmail.com to order a copy (shipping will be added). 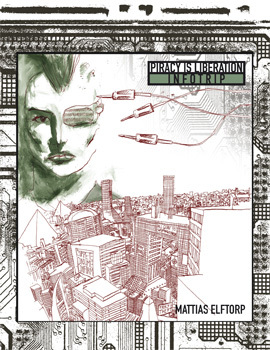 INFOTRIP is a graphic novel by Mattias Elftorp that I read (and then somehow lost) in Copenhagen the other day. It’s postfuture science fiction with an art style that seems to me to combine Brian Wood with Ben Templesmith, to jagged, hate-ridden, nervous effect. I really like it, and I’m pissed off that my copy got mislaid.